It's taken me YEARS to find the right skincare routine for my skin, and I finally feel like my skin is more stable than it ever was. I used to have acne and still struggle with hormonal break outs, with the odd cystic spot. My skin is very oily as well, which is something I've always struggled with, and probably always will since that's just my skin type. For the New Year I decided to go completely cruelty-free on my cosmetics and skincare, and I'm so glad I did because, I've found some amazing budget beauty products! Everything I'll be mentioning below is cruelty-free. I use this foaming tea tree face wash every morning in the shower when I wash my face. Tea tree is great for acne and spot prone skin with it's purifying and antibacterial properties that kill the bacteria causing spots. I find this face wash isn't too harsh on my skin like I find most acne-targeting products are. It also contains salicylic acid and witch hazel to fight against blemishes as well. It's always important to tone your skin to remove any left over dirt from cleansing, as well as tightening your pores. I love this seaweed toner, and it's great for oily and combination skin. My skin always feels more matte after using this, which is what you need when you have oily skin. I use this twice a day, both morning and night in my skincare routine. Now this product is aimed at normal to dry skin, but as it's an eye cream, I find it does a brilliant job at protecting and moisturising the delicate skin around my eyes, since I use harsher products on the rest of my skin to combat my spots. I feel like this cream has really made a difference to the brightness of the skin around my eyes and it's non-greasy, so it doesn't feel heavy. This is my morning and daytime cream as it's very lightweight on the skin. Gel based creams are great for not leaving oily skin feeling oilier than it needs to. This cream leaves my skin feeling clean and matte as it helps to balance the oil. I use this eye makeup remover on a night with two cotton pads to remove my eye makeup. It even removes my heavier makeup looks, and waterproof mascara which I thought was bloody amazing when I first tried it. This is my second one, and I think this will be a firm favourite for a while. It's super gentle for the delicate eye area, and makeup just glides off, so you don't need to rub unnecessarily. I go between both the Camomile Cleansing Oil and the Butter, but I think I prefer the Cleansing Oil slightly more because it's easier to work into the skin. Both of these products are great at melting your makeup away after along day and are very calming and gentle on the skin. I apply them to dry skin and wipe away with a warm, damp flannel or muslin cloth. For the night time, I like to use a more moisturising cream, since so many of the products I use can be quite harsh on the skin - with all the tea tree oil, salicylic acid and witch hazel. This cream doesn't make my face feel greasy or heavy, it settles just nicely, and I feel like it really helps prevent my skin from drying out a bit too much with the other products. I absolutely love clay masks, they're my favourite type of mask to use because they work with my skin so amazingly. If you're a fan of the Himalayan Clay mask by The Body Shop, this is a good alternative as it has the same effect. I use this mask once or twice a week on an evening to do a really deep cleanse of my pores, and it's especially good when I'm having a spot breakout. I use this blemish gel with witch hazel at night after my usual skincare routine; when I have a particularly nasty break out. It helps to clear up my spots quicker than usual, and it really helps to balance the oil on my skin. 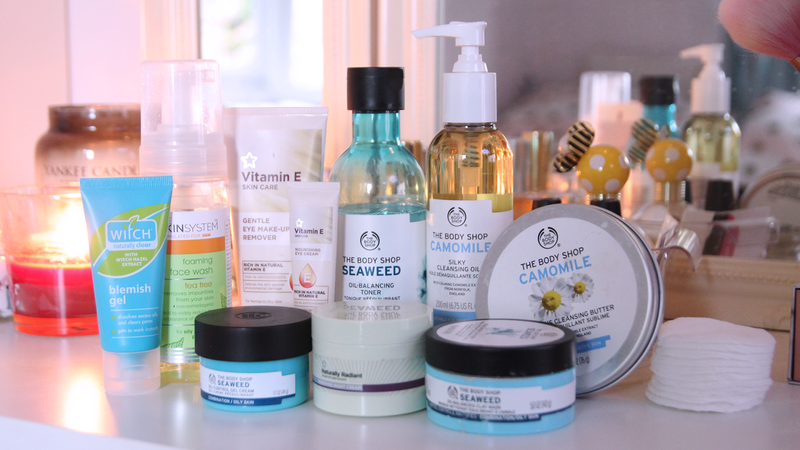 Usually, I'm all for budget beauty, and while The Body Shop isn't exactly cheap, nor is it high end; I do find the quality of the products are worth it. It's particularly good when they have special offers on, which is when I tend to buy from them. Equally, I think Superdrug have released some pretty impressive skincare products for such a low price. 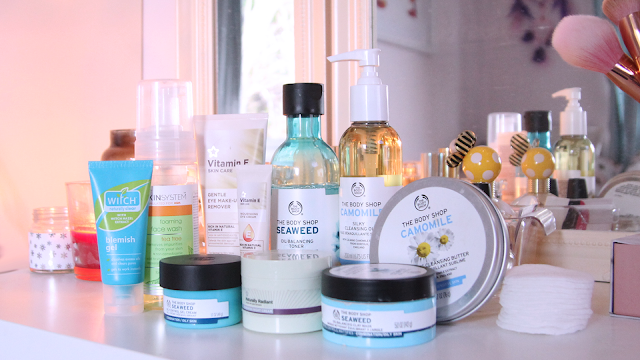 I'm really pleased I've found products that seem to work with my skin after trying so many different things, and it's a huge plus that they're all cruelty free. Have you tried any of these products and feel the same way? I'd love to know any recommendations for other skincare products for oily spot, prone skin. If you end up trying one of these, I'd also like to know what you think of them!